The car is a modern, individual command system. It is a big, metal personal bubble. It roars, it speeds, it turns, it stops. The car is an escape pod from life. It is where many people find solace and purpose, comfort and joy. And, in Steven Knight’s recent film Locke, the car is given one of the most loving and strange treatments it has ever received in mainstream cinema. Knight’s 85-minute film only ever leaves its protagonist, Ivan Locke (Tom Hardy), and his car for a few stolen moments, often to show swarms of other cars speeding down the highways. The film opens with shots of a construction zone at night, and we are first introduced to Locke through two things: his heavy, dirty work boots, and his pristine BMW X Series SUV. Locke takes off his boots, wrapping them up carefully before climbing into his car. The SUV is a thing of wonder; the dash lights up in pleasing yet subdued colors, and the steering wheel automatically adjusts itself to Locke’s personal setting. From the beginning, the car is presented almost like a spaceship, and with Dickon Hinchliffe’s modern, dark yet jangly soundtrack, some early bits of Locke feel like a BMW commercial: the sleek car darting through the night to the swelling music, the scene dark, urban, and sophisticated. Locke unfolds essentially in real time over a two-or-so-hour drive between Birmingham and London, during which Ivan Locke, construction manager and family man, tries to traverse the unraveling of his personal and business lives on Bluetooth, all without leaving the driver’s seat (though perhaps a better word would be cockpit). Locke behind the wheel is like Captain Kirk sitting in his big chair on the starship Enterprise. The only difference is that Kirk is surrounded by crewmembers. Locke is always alone. In fact, Tom Hardy is the only actor who actually appears in the film. There are many voices that alternately howl and whimper and coo and gasp across Locke’s high-tech car phone, including his wife, his son, his boss, a policeman, a doctor, a drunken city council member, but no other faces. Not even glimpses. Yet the philosophical and psychological complications of Locke’s arc through the dark night ultimately fall moot beside the galloping pace and the one-two punch of Knight’s direction and Hardy’s acting. The film is as tight and gut wrenching as a well-paced thriller (which perhaps explains part of the decision behind casting Hardy, whose previous roles include leading parts in The Dark Knight Rises, Inception, and Tinker Tailor Soldier Spy). It has you by the balls in 15 minutes, entranced by its slow, smoldering burn. Despite the film’s sparseness and trimmed-down story line, it is not a cinematic ode to the car, the drive, or the road. Knight utilizes a variety of different camera angles of the car, mainly sticking tight to either the interior or direct exterior of the SUV, using the always-fruitful combination of lights, night, and reflection in a way that’s popping up everywhere (even in TV shows) since Iranian director Abbas Kiarostami’s rise to fame. Yet the various shots, while playful and interesting, often seem to be almost a visual tic, more a means of maintaining visual interest than advancing the film. This is a concession I think most viewers will be willing to give Knight, as the shots are well handled, electric lights abstracting into flowing patterns across the sleek glass. Such moments also offer a much-needed distance from Locke in his darker moments. It takes a bit of time and distance to truly appreciate Hardy’s acting; his Locke is one of those performances so effective and distinctive that the actor and role meld in your mind. 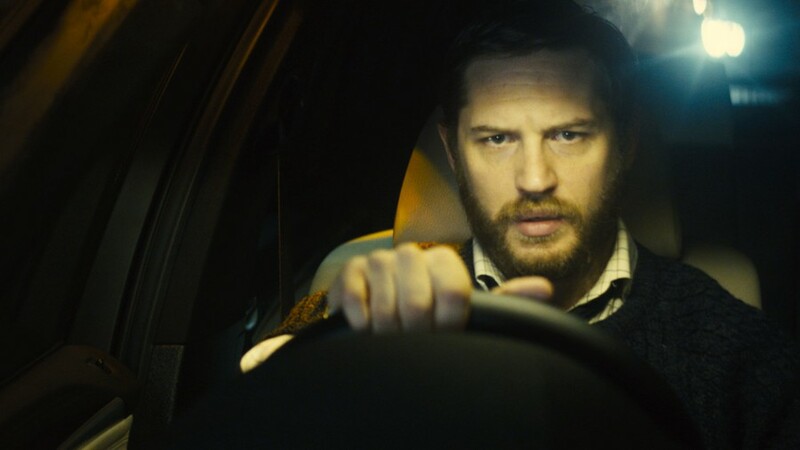 Hardy manages to make Locke fanatical yet human, and his almost Shakespearean soliloquies—delivered to the empty car—would’ve come across as ridiculous in other hands. What is perhaps most intriguing about Hardy’s performance is precisely how not-strange he manages to make these little speeches, which are far and away the weirdest parts of the film. One wonders if he took some cues from Gary Oldman’s fantastic monologue to an empty chair in Tinker Tailor, though instead of Oldman’s suave, underhanded delivery, Hardy injects an almost manic fury, which bubbles hotly right below the surface. There are many visual cues throughout the film to help the viewer follow Locke’s slow deterioration: sleeves rolled further and further up, nose and eyes reddening, hair increasingly mussed—but the most convincing and subtle of these changes is Hardy’s incredible command over his voice. Throughout the film, Locke’s strange accent (oddly reminiscent at times of Peter Sellers’s location-and-personality-less cadence in Hal Ashby’s 1979 Being There) ebbs and flows so delicately you hardly even realize it’s changing until Hardy is in the midst of a cascading, deep brogue. His voice lulls, explodes, growls—but mainly it explains, pleads, and surges on, on, on. Locke is determined to be a good person, yet one that’s powerful and in control. And, courtesy of cinema sound systems, you can feel it in your bones as his low voice drives onward, with hints of exasperation and hope. Locke is playing at AMC River East 21, 322 East Illinois Street, and Landmark Century Centre Cinema, 2828 North Clark Street.